Next month, Vancouver will have a new mayor and council after a historic election. Eight of the 10 councillors will be women, and three of them will represent the Green Party. The Non-Partisan Association (NPA) elected five members. Each of two centre-left parties that supported incoming mayor Kennedy Stewart – the Coalition of Progressive Electors (COPE) and OneCity – elected one councillor. A Research Co. survey of Vancouverites who cast a ballot – either in the advance polls or on election day – serves to outline several changes in the way the municipal campaigns were run. Four years ago, when there were no limits on political donations from unions and corporations, 85 per cent of Vancouverites who voted said they saw, read or heard an advertisement for a mayoral or council candidate. This year, the proportion dropped to 73 per cent, a sign that campaigns had a much tougher time on the airwaves. 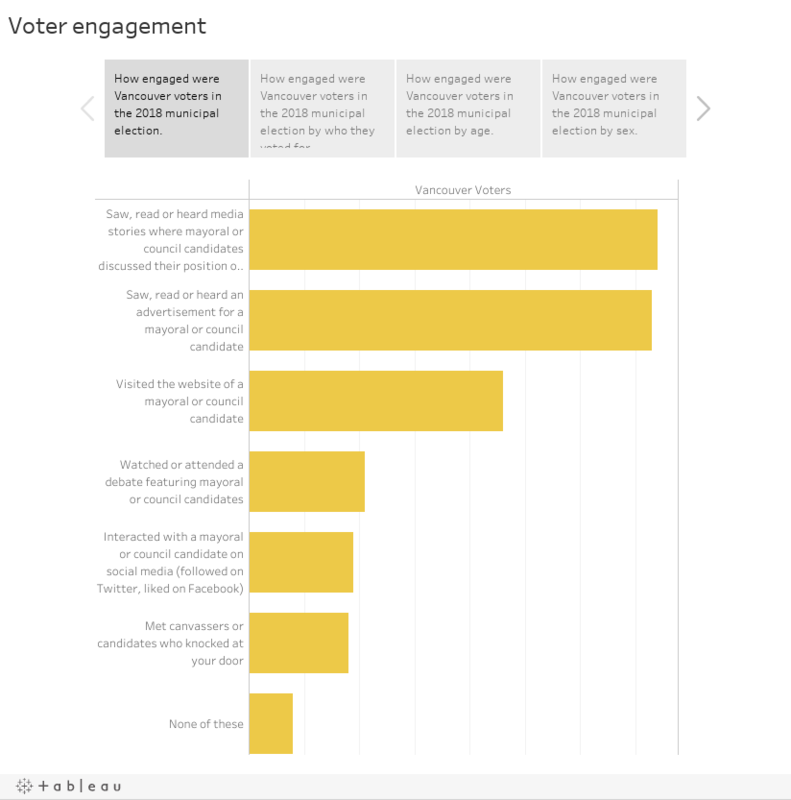 The absence of ads meant that campaigns had to rely on the internet to reach prospective voters. Almost half of Vancouver voters (46 per cent) say they visited the website of a mayoral or council candidate. This represents a seven-point increase compared with what was observed in the 2014 municipal election. Interactions with mayoral or council candidates on social media also increased slightly, from 16 per cent in 2014 to 19 per cent this year. There was little change in the proportion of residents who attended or watched candidate debates or those who met canvassers or candidates who knocked at their door. When asked about the factors that led them to support a specific candidate, the centre-left independents had a massive advantage on platforms. Seven-in-10 Stewart voters (70 per cent) and four-in-five of those who voted for Shauna Sylvester (80 per cent) say “ideas and policies” where their main motivators. The NPA’s Ken Sim is way lower on this category, at 45 per cent. Sim’s voters were more likely to say they were motivated primarily by a “desire for change at city hall” (27 per cent, compared with 17 per cent for Sylvester voters and 12 per cent for Stewart voters) as well as party allegiance (10 per cent). When asked about possible outcomes for the council election, only 22 per cent of voters in Vancouver said they would have been happy with the NPA having a majority of the seats in city council. This proportion includes 75 per cent of Sim voters, but fewer than one-in-10 of those who supported either Stewart and Sylvester. Almost half of Vancouverites (48 per cent) would have been content to see four Green Party members elected to council, including 73 per cent of Stewart supporters. The Greens ended up electing three of the four contenders that were listed on the ballot. In spite of the differences that were observed in the final weeks of the campaign, supporters of the two main independent candidates would have been satisfied with either of them winning the mayoral election. Among all voters, 54 per cent said they would be happy with Stewart as mayor, including 56 per cent of those who voted for Sylvester. Almost half of all voters (49 per cent) would have been content with a victory for Sylvester, including 54 per cent of Stewart supporters. The proportion of residents who would have been happy with other mayors winning the election is decidedly lower. Just over a third (36 per cent) would have been content with Sim becoming mayor, and fewer than one-in-five would have been happy with a victory for Hector Bremner of YES Vancouver (18 per cent) or Wai Young of Coalition Vancouver (17 per cent). Preliminary indicators suggest that voter turnout will be lower this year than in 2014. 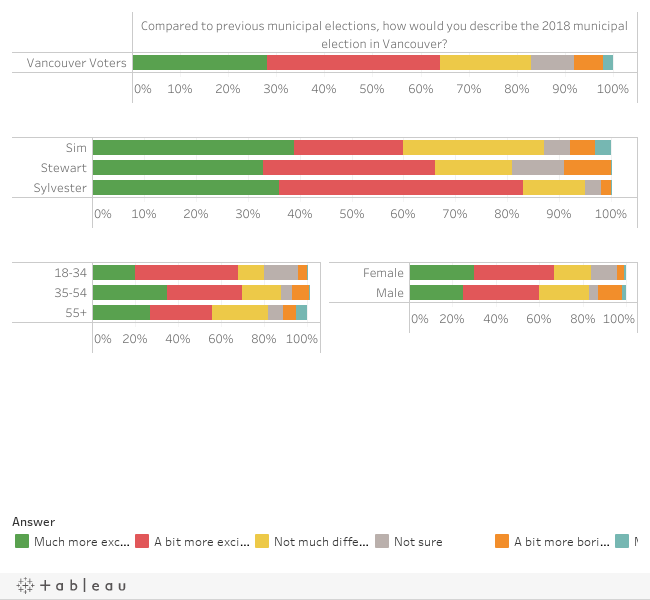 In any case, almost two-thirds of voters (64 per cent) believe that this Vancouver municipal election was more exciting than previous ones, a proportion that includes 68 per cent of those aged 18 to 34. Bear in mind this is a survey of people who cast a ballot and were engaged in the democratic process. This election is a true case study on the effect of the new legislation on corporate and union donations. Fewer residents were exposed to advertisements, and website and social media interaction increased as a result. Still, most voters express satisfaction with the result of the mayoral race and the composition of city council. The real work for the incoming mayor and council will begin shortly. Housing was a key concern for two-thirds of Vancouver voters as the campaign progressed. It will certainly be one of the issues that will make or break the new municipal government.